I had another good week last week hunting down some yard sales. I think it has helped that we haven’t hit many 90 degree days yet here in GA which is rare for June. So yard sales are EVERYWHERE! I have actually been finding some of the best stuff on Friday instead of Saturday. Do you shop Friday yard sales? They are a big thing here – I even see a good many Thursday sales (people will have a Thurs. – Fri sale or a Thurs. – Sat. sale). I know when I have actually had my own yard sale, I have done much better on Friday than Saturday. Picked up this pretty jewelry for $3 total. Loved the red/white necklace combo. Think that I will be finding a time to wear it over 4th of July next week. A game tin for $1.00. We actually didn’t have this game so this will go in our game closet. Another really nice white pillow for $1.50. Man, as soon as I became intent on finding pillows, I started finding them everywhere! Wish I could find some colored and patterned ones. But loving all these white ones for my bedroom redo I have planned. Been forever since I have found or bought a purse at a yard sale. But I couldn’t pass this one up. $3 for a fun Chaps purse (which sells for $60-80 at Kohl’s). It was in brand new condition – I honestly don’t think it was ever even used. And it has a bonus makeup/change purse attached. I have been not finding much at my parking lot yard sale recently except for jewelry. Well that changed this week! Picked up these really nice baskets for $2 each. They are like the Ikea baskets that fit in the Expedit shelves and super sturdy. They will be great for storing items in closets. Also loved this 2 tiered fruit stand. The lady had a bunch of fake fruit piled in it and a price of $8 on it. I didn’t want the fruit at all and really wanted a lower price so I asked her what she would take for just the stand, if I left the fruit. When she said $3, I snatched it up quick! It is the perfect oil rubbed bronze color already and just really nice. Not sure if I will use it in the kitchen or not – thinking I may put it in the bathroom to store/display towels, toiletries, etc. Thirty-One makeup bag – in like new condition for $2 – yes, please! Another pretty pillow – $1.00. And 2 more pieces of jewelry for $1.00. Loved that the black one looked like the popular “bubble jewelry” that you see everywhere. 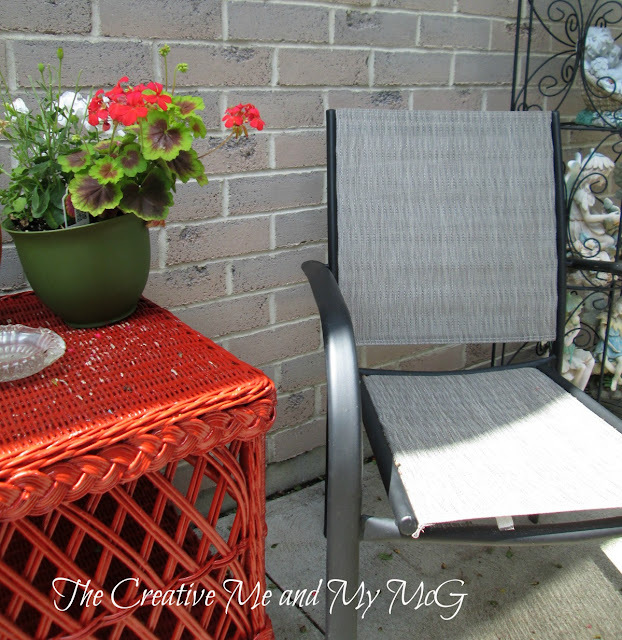 Cheryl found some great outdoor patio chairs and some other things…. in her neighbor’s trash I have trash picked my neighbors before too, have you? Dawn found some cute napkins and other accessories. Come link up your thrift store or yard sale finds or a project or makeover that you did with some past frugal finds. Wow!! You cleaned up! Inspires me to get back out there. That black basket/stand thing would make a great make-up holder. And the purse. Wow! Wow! You got some awesome finds this week! Hope I can get out there tomorrow! Cheryl @ The Creative Me and My McG recently posted..FOLLOW US ON BLOG LOVIN’ !! You have found some amazing buys. Love the purse and jewelry. Great finds! Love Phase 10! Thanks for hosting ! I Love all your great finds especially the black necklace 🙂 Have a blessed weekend ! I never thanked you for the feature! Thank you! Sorry I missed the party but I’ll be joining back with you soon. Hope you are well. Dawn. to choose from as a beginner or existing user. and then click on it again.